Since we've been without cable we've had the neat experience of being able to watch Gunsmoke, Bonanza, and The Rifleman. Watching these shows has really renewed my love for all things Old West, and it brought to remembrance a research trip to Abilene, KS and my discovery of a man who was a pioneer as well as a true hero. One look at Jesse Chisholm and you can see he's not your ordinary white man. 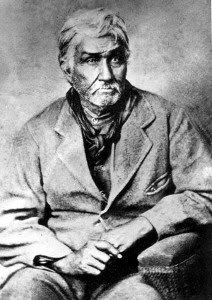 Born around 1805 in Tennessee to a Scottish father and a Cherokee mother, it's no surprise Jesse was a good business man. When the Cherokees began moving themselves to Arkansas, Jesse and his mother went. Later, and I can only imagine the circumstances, they moved into what is now known as Oklahoma. Jesse set up a trading post in Council Grove, OK (near Oklahoma City). From all accounts, Jesse was a friendly man, and very diplomatic. One of the things I found very interesting about Jesse is that he spoke many languages. Somewhere there is an account that he spoke over fourteen of the tribal languages, making him an ideal man, not only for trading, but for diplomacy when it came to negotiations among the various tribes. One thing of note here, when we think of Indian tribes and treaties we tend to think of those treaties in terms of the white man. But sometimes issues arose between the tribes. Jesse was known for listening to both sides, really listening, before seeking out a solution. Although Jesse had left TN well before the Trail of Tears began, you should understand that it still could not have been easy for him. There was a distrust of the white man, as well there should have been, and there was a lot of prejudice against mixed breeds (sounds harsh, but it was the reality). I'm pretty sure Jesse's friendliness and willingness to listen gained him a lot of trust with those he encountered. Jesse wasn't only a trader and a negotiator, he was also a trail guide. 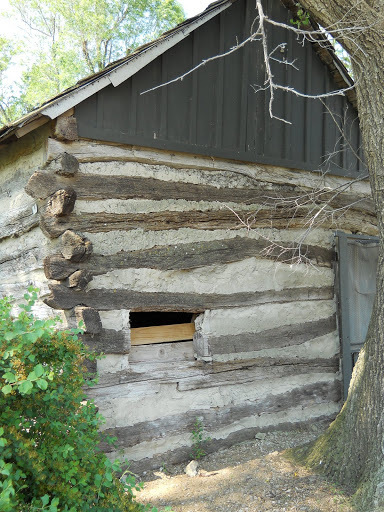 It was during one of his trail guiding trips in 1836 that led him to Wichita, KS where he set up another trading post. It is this trail he used between Council Grove and Wichita that would become known as the Chisholm Trail. Some believe the Chisholm Trail had begun and ended as a cattle drive to Abilene, but that isn't the case. When the Civil War threatened to tear apart the United States, it also divided many of the Indian tribes. The greatest division seemed to be amongst the Cherokees themselves (this topic deserves a blog of its own). The result of the division was a mass exodus of Indians to the north, settling into Kansas. Jesse used his trail to Wichita to bring those who wished to flee the south. I hadn't a second thought about the Chisholm Trail, until the conductor of our train ride mentioned Jesse. My attention grew as the conductor spoke about Jess and his death. It was during my research of his death that I discovered what a wonderful man Jesse Chisholm was. During a time when kidnappings and ransoms were common place amongst the tribal nations, Jesse often ransomed hostages himself, especially when children were involved. His actions spoke his heart. He cared for people, no matter who they were. Jesse died in 1868, only a year after the Chisholm Trail was used to drive cattle all the way to Abilene, KS, the first real 'cow town'. As for Jesse's death, he died of accidental food poisoning. Supposedly, Jesse's favorite meal was bear grease and honey. I've searched around to find exactly what this was, but no luck. From what I gather it was bear meat, honey, and possibly nuts. Jesse's wife, of Cherokee blood, often made this for him in a brass pot. It was after one of their travels where she had bought a copper pot that she made Jesse's favorite meal. Something in the food had a chemical reaction with the copper pot and poisoned him. Jesse Chisholm was one of a kind. What a neat guy! He sounds like someone you'd definitely be blessed to know! Thanks for a wonderful post Christina! Very interesting post about a truly interesting man. Jesse Chisholm must have really had a gift for learning languages. I've read that people used to think tomatoes were poisonous. Turns out they ate them in pewter bowls, and the acid in the tomatoes reacted to the lead in the bowl, giving the diners lead poisoning. I wonder if that's similar to what happened to Chisholm. Fascinating post, Christina. I was skimming, but then went back to the top to read every word. I didn't know how the Chisholm Trail got its name or anything about Jesse. Thanks for sharing your research.